can call for a Convention to propose them. Both are acceptable means of amending provided by the Founding Fathers in Article V.
Once agreement of proposed amendments is attained they must be ratified by the states before becoming law. Why is a Constitutional Amendment necessary? The Supreme Court's Citizens United ruling gutted existing federal and state laws regarding spending in elections. This included over 100 years of effective campaign finance laws right here in Texas. Our founders knew that even an elected government could become deaf to the people's wishes, Only a constitutional amendment can reset the court's scope or parameters in deciding law. Thus, the framers wisely gave us this ultimate power when they devised the amending procedure. Isn't Amending the Constitution almost impossible? 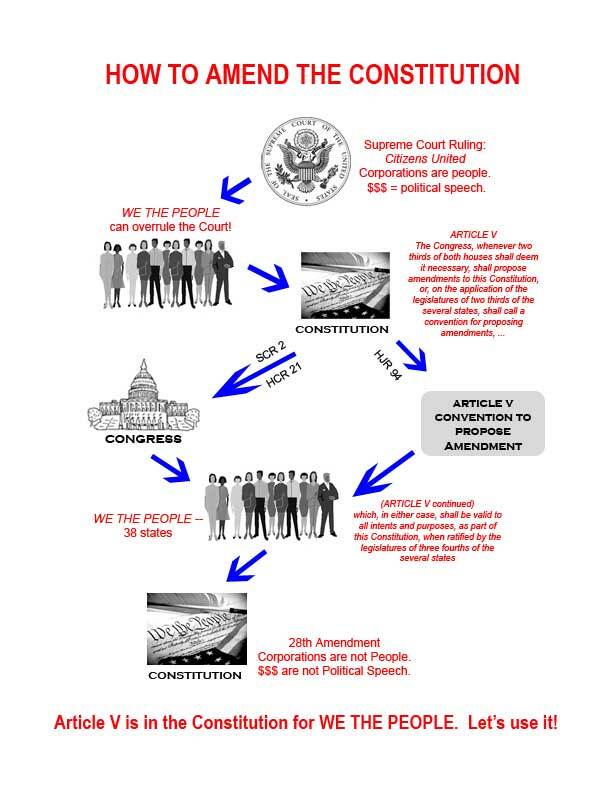 The bar for amending the Constitution was intentionally set high (2/3 of the states or Congress to initiate and 3/4 to ratify an amendment) because this instrument is at the core of our government and must not be subject to political whim. The founders knew equally well that amending the Constitution must not be prevented, so they devised two ways to do it. Has the Constitution been amended recently? The Constitution has been amended 27 times. The first ten are enshrined as the Bill of Rights. Since 1950, six amendments have been ratified. Constitutional amendments have resolved hotly disputed issues that we take for granted today, such as women's right to vote and abolishing slavery. Courageous citizens worked hard, often at great personal risk, to build support for those amendments while others, incredibly, fought to maintain the status quo. We stand on the shoulders of those who accomplished what seemed impossible for those times. Today we face an equally daunting job of putting a stop to the corrupting influence of money in politics. As long as powerful corporations and super wealthy individuals can impact our elections and legislation disproportionately by the power of their money, our government can not serve the citizens. This is a crisis that can only be remedied with the 28th amendment to the US Constitution. This is the defining issue of our time. Open and unaligned discussion of why we need a "We, the People" Amendment.